We believe everyone should have access to a good quality of life, which means equal opportunities to access information and support services. Ask Izzy, the mobile website that helps people in need now and nearby, was recently recognised by the Sydney Smart City 2017 Awards for doing just that when it received the Best Community Initiative Award. And it’s not just us who believes technology is the key to providing equal access to information and services across a community. Heather Nesbitt, Social Commissioner at Greater Sydney Commission, presented the award to Ask Izzy and believes harnessing technology is crucial in improving people’s lives – especially when it comes to those who need help the most. “We all benefit from having a more equitable, supportive and cohesive community,” says Heather. 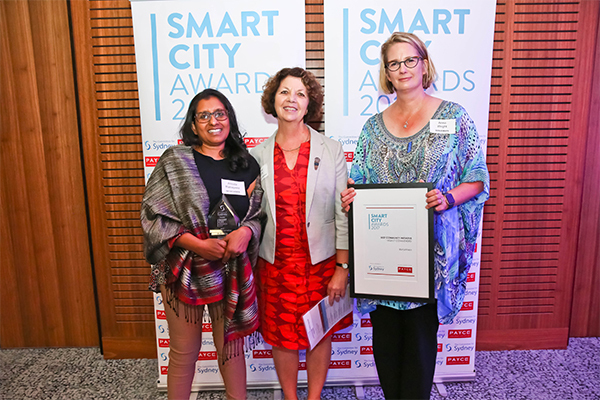 Left to right: Amodha Ratnayeke Online Applications Manager at Infoxchange (Ask Izzy), Heather Nesbitt Social Commissioner at Greater Sydney Commission, Banjo Maps representative Highly Commended for Best Community Initiative Award. Heather says Ask Izzy’s use of technology to connect homeless people to services, giving them the power to address the issue themselves, is what made the mobile site stand out as a clear winner for the Community Initiative category. “Ask Izzy really took a fresh look at how to use digital technology to help one of our most vulnerable groups in the community,” says Heather. Ask Izzy was developed by Infoxchange in partnership with Google, REA Group and News Corp Australia. Most recently, Ask Izzy Help at Hand, funded by the NAB Foundation, aims to enhance and raise awareness of Ask Izzy for people fleeing domestic violence. Previous to this project was the Ask Izzy for Victorian Aboriginal Communities project funded by the Victorian Government’s Public Sector Innovation Fund. For someone who is in a crisis, the last thing they need is their mobile phone running out of charge right when they need it most. Your donation of a $15 Ask Izzy power card will give someone enough mobile charge to find help them find a meal, somewhere to stay, financial assistance and much more.